Motile microorganisms such as the green Euglena gracilis use a number of external stimuli to orient in their environment. They respond to light with photophobic responses, photokinesis and phototaxis, all of which can result in accumulations of the organisms in suitable habitats. The light responses operate synergistically with gravitaxis, aerotaxis and other responses. Originally the microscopically obvious stigma was thought to be the photoreceptor, but later the paraxonemal body (PAB, paraflagellar body) has been identified as the light responsive organelle, located in the trailing flagellum inside the reservoir. The stigma can aid in light direction perception by shading the PAB periodically when the cell rotates helically in lateral light, but stigmaless mutants can also orient with respect to the light direction, and negative phototaxis does not need the presence of the stigma. The PAB is composed of dichroically oriented chromoproteins which is reflected in a pronounced polarotaxis in polarized light. There was a long debate about the potential photoreceptor molecule in Euglena, including carotenoids, flavins and rhodopsins. This discussion was terminated by the unambiguous proof that the photoreceptor is a 400 kDa photoactivated adenylyl cyclase (PAC) which consists of two α- and two β-subunits each. Each subunit possesses two BLUF (Blue Light receptor Using FAD) domains binding FAD, which harvest the light energy, and two adenylyl cyclases, which produce cAMP from ATP. The cAMP has been found to activate one of the five protein kinases found in Euglena (PK.4). This enzyme in turn is thought to phosphorylate proteins inside the flagellum which result in a change in the flagellar beating pattern and thus a course correction of the cell. The involvements of PAC and protein kinase have been confirmed by RNA interference (RNAi). PAC is responsible for step-up photophobic responses as well as positive and negative phototaxis, but not for the step-down photophobic response, even though the action spectrum of this resembles those for the other two responses. 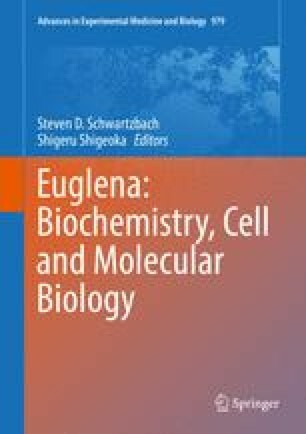 Analysis of several colorless Euglena mutants and the closely related Euglena longa (formerly Astasia longa) confirms the results. Photokinesis shows a completely different action spectrum. Some other Euglena species, such as E. sanguinea and the gliding E. mutabilis, have been investigated, again showing totally different action spectra for phototaxis and photokinesis as well as step-up and step-down photophobic responses. The authors thank their long-time coworkers Peter Richter, Maria Ntefidou and Sebastian Strauch, who have critically read this manuscript. The financial support for the underlying work for this review by DFG, DLR, BMBF and JSPS is gratefully acknowledged.